Dining rooms can do a lot of things... blend in, serve as transitions, or have a personality all their own. 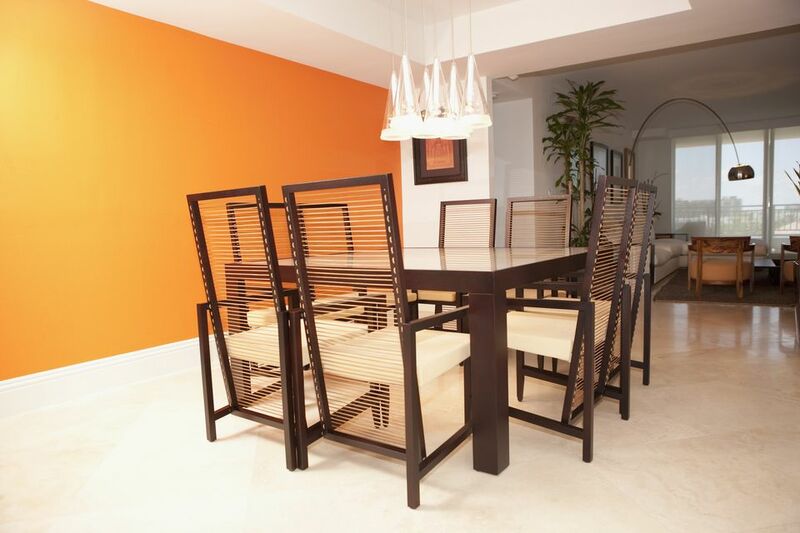 And nothing sets the tone of a dining room like the right wall color! Should you go bold with blue? Yes, blue—normally a relaxing color—is considered bold when it comes to dining rooms, as it is so rarely used. What about an earthy brown, like the designer paint Ralph Lauren Sisal? Reds and oranges are lively and promote sociability. Browse this gallery of colors of nationally available paints to find what might be the next new color for your dining space. A blue dining room? Conventional wisdom doesn't exactly say, "No," but rather, "Be careful, if you do." It's often said that if you want to lose weight, put some blue food on your plate. The same might be true for a blue room that's too over the top—but when kept light and airy, blue can be an especially refreshing choice. This color emphasizes the clean white of Ralph Lauren Home's classic Picket Fence White. Offsetting the wall brightness is the darker door (in the color Walnut) and the even darker trim (in Warwick Lodge). Can there be too much brown in a dining room? Not so with these colors from Dutch Boy. These tones incorporate tints of bronze to make for a more lively color scheme. It doesn't hurt to have the lighter-colored crown molding to add a visual "stop" for the verticals. Red is a stately, regal color. With Benjamin Moore's dustier muted red, Raisin Torte, the color is authoritative without being overbearing. Painting the wainscot in Jackson Tan with White Dove accents further lightens the mood. The effect was muted and graceful ​in the red dining room from Benjamin Moore. Not so with this paint from Glidden! This is full-on red. It's called Red Delicious, and it's sure to stimulate appetites and conversation alike. Note how everything in the room—chairs, table, lilies, and flooring—pop out in contrast to the vibrant red. Tawny is the inspiration for this dining room color. Defined by Webster's Dictionary as "a dark yellowish or dull yellowish-brown color," tawny is a nice brown for your dining room that has just enough warmth to keep it lively and interesting. How blue can you go? Apparently, very blue. Even though blue is a dicey proposition as a dining room paint color, Mosaic Tiles from Dutch Boy brings it down to its darkest level. The splash of Ultra White on the trim helps to freshen up the paint design. Glidden whipped up a palatable pumpkin-y color that you can live with all throughout the year. It's a muted orange called Pumpkin Patch that injects instant cheer in your dining room. Not a fan of yellow paint? Well, this is one you just might like: Dusty Gold from Glidden. It's yellow with rich gold touches added for a more classic look. When you paint your dining room red, consider an option like this: a red that's not a lot of red. Red is so strong that even limited areas can carry the load. Here, the walls are mainly Valspar Craft White. Then, Calico's red in the upper third of the dining room wall—and topped by another line of Craft White, this time in the form of crown molding—completes the picture. Who Says Ceilings Have to Be White? While the default paint option of most dining room ceilings is white, why choose what everyone else has? This ceiling paint—Chestertown Bluff—is the true star of the room with the neutral Delaware Putty on the walls hanging back, both paints by Benjamin Moore. Now, is this or is this not a vibrant and electric dining room paint color? Admittedly, it takes guts to put Dutch Boy's Eclectic Plum on your dining room walls—but who ever said that this room had to be a shrinking violet? Devoe Paints: the Freshmaker? Well, minty-green is what we feel when we look at this paint scheme. It's called Elysian Fields, and while we don't find it the most appetizing color—it feels a bit medicinal—this might be the one for the homeowner looking for a green that isn't imposing. The default coordinating color is white, and this one is called White on White. It's funny the way a mere coat of latex just a fraction of a millimeter thick can entirely dress up a room. Yes, that's the power of room paint. The house here is a regular suburban home, but with the addition of this deep-tan color (Beacon Hill by Devoe) in the dining room, along with coordinating black furniture with white upholstery and the white marble table with the black base... well, now it's a lot more fancy. Gray and white is certainly a popular road for dining room color designs, but you can hardly go wrong with it if you're looking to introduce a stately, elegant feeling to the room. From California Paints, this is Wells Gray with Modern White. You may even notice a bit of orange peeking out from the adjoining room (Bronzed Plate)! In contrast to our earlier (also California Paints) photo of a gray and white dining room, this one flips the colors around. Now, gray (Quincy Granite) is the dominant field color, with their Sensible White being used for ceiling and crown molding. There's nothing shy about this paint scheme. The wall color (Highlight Gold from California Paints) first captures your attention, then your eye immediately zooms upward to the fantastically sock-you-in-the-face orange of the ceiling!